1.) 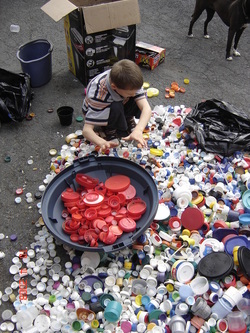 Organizing a Creative Community Collaboration, in this case we call it a "Put A Lid On It Project." 2.) Making a mural as easy as 1,2, 3 with a custom "Masterpiece Art Kit." Our recommendation is to find a wall large enough to hold an 8' x 10' (minimum size) mural either horizontally or vertically. We will work with you to make the planning of your Put A Lid On It project a success and making your Masterpiece Art Kit is key to your project so we will get all the details from you and surely will get you thinking about a million other aspects of your project but the outcome will be an easy to use kit with easy to use (made in America!) directions. DON'T BEGIN THIS PROCESS UNTIL FIRST COMPLETING STEP 3 because there might be a lot of colors you wont need. Once you are ready to begin this step it is our recommendation that you get your citizens or businesses from your community involved especially businesses that might go through a variety of bottled products in order to reclaim a variety of lids. Example: Cracker Barrel restaurant has great smaller lids brown and green lids that come off of mini syrup bottles. Anyone can do it. Whether on your driveway or in a sink, in a bucket on a bathtub, in a dishwasher or washing machine the menial job has got to get done. WARNING: if you do this in a dishwasher make sure that they don't get down near the heating elements or the source of heat or certain lids may melt! It's as easy as 1, 2, 3 or maybe 1, 2, 3, 4, 5, 6, 7, 8, 9, 10, 11 and so on, but you get the picture! Adults who work in construction would be great for this step of the project and we recommend getting them involved from the beginning so that all the hanging details are worked out ahead of time. What we have found though is where there is a will there is a way so don't let a cinder-block wall be a deterrent or a spot where you want a mural but there is no wall - WHAT!?! "No wall?" Sure, we are creative beings we can solve problems, and make new ones for ourselves, but the point being that we can even figure out how to solve this conundrum with engineering and creativity skills. Of course! By this point everything has been accomplished and you have united a lot of people in the process of making the work of art. Everyone now should have a sense of ownership and accomplishment so celebrate the completion of the Put A Lid On It community collaboration project. Get the Mayor, Governor, or President to come to the unveiling but have a child or two who really "got it" to uncover it. *DISCLAIMER: there is one impairment that might be a little challenging for a couple of these tasks. 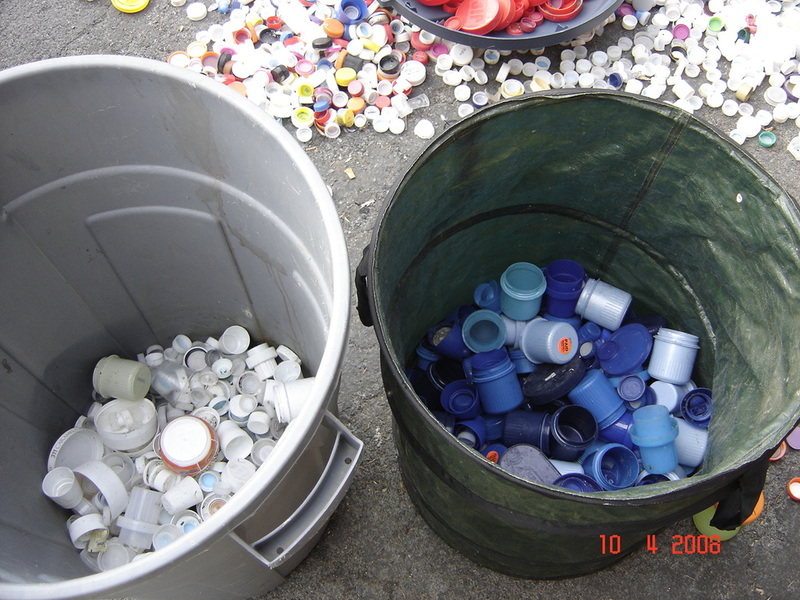 If an individual is what one might call "Color Blind" then we really aren't sure how their involvement in Separating lids by color or by adhering the lids would work for them. We will have to get back to you on this one!